This morning around 5:45 am, I was pulled away from my dreams as calls to prayer resounded through the air. One imam began with a soothing, mournful melody. Voices of several other imams drifted from further out in the city all flowing together into one chorus of conflicted sorrow. Each voice quieted to a pause at times before again crying out into the still, sun-less sky. This ebbing chorus lasted much longer than one of the daily calls to prayer, sustaining a disturbance of the pre-dawn silence for nearly fifteen minutes, while a regular call may last a minute or less. I was not disappointed with being awoken at such an early hour; I was too moved to react in such a manner. I have never had a call so dramatic, so conflicted, so pained reach my ears. Language is not always necessary to communicate sentiment, emotion. The song of the nearest imam reverberated through our apartment. I was so affected by the song of one man that it moved me from my bed to the window facing the mosque. There is something beautiful about one voice, one song reaching every ear in the city. Whether a believer or not, you share in the moment. 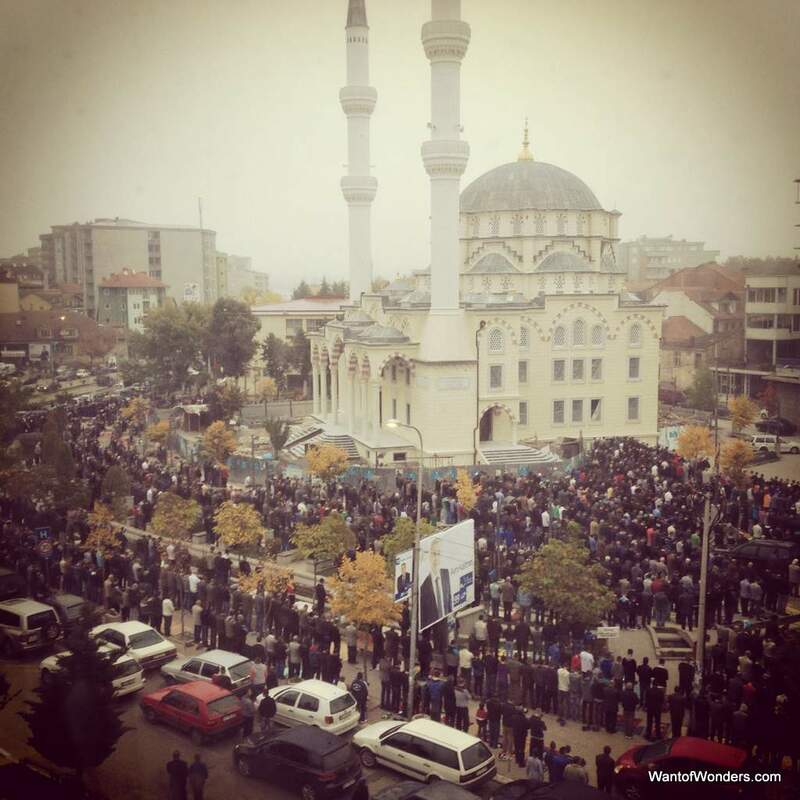 6:00 am brought only a few followers to the central mosque in Mitrovica. A second calling-out just before 7am succeeding in galvanizing more worshipers to appear. Hundreds flooded through the streets forming a parallel parking lot three cars deep on both sides of the street. This group of all males lined into the mosque entrance until space inside filled up. The crowd spilled into the surrounding courtyard until it could not be contained there alone. As 7 o’clock approached, more men gathered in the grassy strips of median in the road and the sidewalks across the street. Prayer rugs and cardboard boxes were unfurled on the ground in concentric half circles facing southeast. Just past 7, the call turned to prayer, and those gathered rose and fell in the routine of communicating with God. Today is Kurban Bajram (also called Eid al-Adha), celebrated by Muslims all over the world as the day Ibrahim (Abraham) was willing to give up his first born son in obedience to his God. “Kurban” means sacrifice and this is indeed the theme of the day, something that whether Muslim or not we can all relate to. To celebrate, there is no work or school. Families gather together and prepare a feast. Traditionally, an animal is slaughtered following the theme of sacrifice. A third of the meat is eaten, a third given to friends, and a third given to those less fortunate. Though Mitrovica is a mostly urban environment, live sheep were sold in a makeshift pen of shipping pallets on the side of the road yesterday and today. All that remains of them now is feces, bits of hay, and a distinct stench around the empty polygone of pallets on the sidewalk. By late afternoon, it was clear most festivities were over as people reappeared on the streets to congregate in cafes and roam the sidewalks in their typical daily fashion. There were some noticeable changes from the everyday even after the city returned to life. Everyone was dressed in their best clothes, formal even for Kosovo standards. 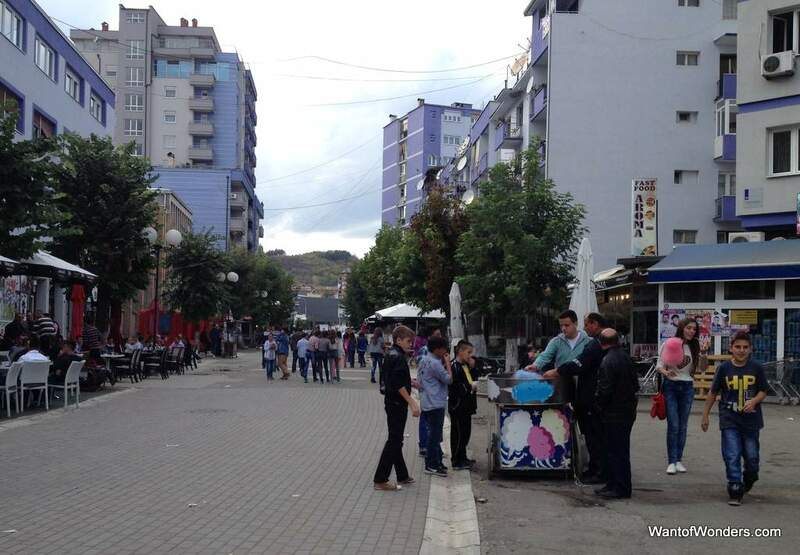 Shops remained almost entirely closed, but cafes opened up. In addition to the usual pomm frit and seed vendors on the main street, there was also an old man selling heavily-dyed cotton candy to children. Little ones smiled with hot pink and royal blue mouths and mustaches as they walked around town holding their older siblings hands. I could not help but be reminded of American Thanksgiving as I witnessed families and children stroll through yellow-leafed littered streets on their post-feast walks. Though there is no religious or traditional connection, I think anytime families gather around a feast and spend the day away from their typical worries and focused on one another, it is always a time to give thanks; anywhere and everywhere in the world, it is a beautiful day and a day I am happy to witness. A beautifully written post – thank you! Very beautifully written indeed! Welcome to Mitrovica, and enjoy your stay! I see from your posts you’re already learning the ropes around here, with the lack of water and all :). I wish you all the best. If I see you guys around town, I’ll gladly invite your for a cup of coffee ;). Agim, Thank you very much! We are doing our best to learn the ropes. I hope to bump into you in Mitrovica.